Skolkovo resident 3D Bioprinting Solutions made headlines around the world in 2015 when it printed a functioning thyroid construct and transplanted it successfully into a mouse. Now it looks set to make history again by sending a bioprinter into space. 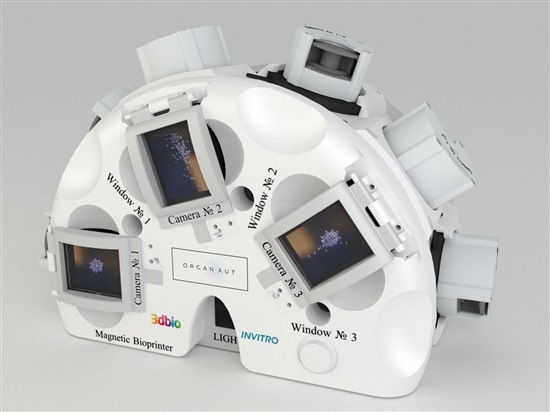 The magnetic OrganAut looks nothing like 3D bioprinters used on Earth. Photo: 3D Bioprinting Solutions. 3D printing on Earth is already being developed as a way to print human organs and tissues: research that could save the lives of millions of people currently waiting on long organ donation lists. But scientists have also long been interested in growing cells in space: on Earth, cells grown artificially grow in a flatter structure than they do naturally in the human body. When grown in conditions of microgravity, however, the cells take on a more natural structure. Microgravity also makes possible the use of a new kind of 3D printing: formative technology. “On Earth we use additive technology to create things in layers,” explains Usef Hesuani, cofounder of 3D Bioprinting Solutions. “Today we can print tissue-engineered and organ constructs with some success, but this technology has many limitations. 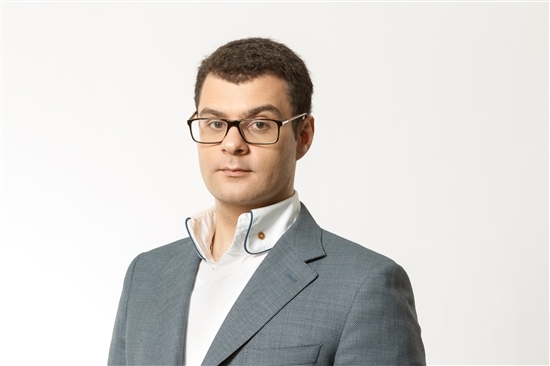 To make more complex constructs, it makes sense to create new types of manufacturing known as formative,” when objects are not made in layers, but added to from all sides, “like a snowball,” Hesuani told Sk.ru in an interview ahead of the conference. The ultimate aim of the research, which is being carried out in partnership with Roscosmos, the state space corporation, is to study the effects of radiation in space on the human body in order to help develop protection for cosmonauts. As companies and countries set their sights on lunar bases and reaching Mars – well beyond the Earth’s protective magnetic shield – this is an issue that looks set to become more and more pressing. A study published in 2016 appeared to show a higher incidence of cardiovascular disease among Apollo crew members: the only astronauts to have flown beyond Earth’s magnetic shield. The U.S. space agency NASA issued a statement saying it was not possible to determine whether cosmic ray radiation had affected the astronauts on the Apollo missions to the moon, and said it welcomed research into the health effects of space radiation exposure in order to identify biological countermeasures. “The great thing about the bioprinter is that it doesn’t need controlling, either from Earth or on board the station,” says Hesuani. Together with its innovative 3D printer, 3D Bioprinting Solutions is sending into space the cell tissue needed to print a mouse’s thyroid gland and human cartilage. “These are the types of tissue we are actively working on in our lab, so they provide us with reference points,” explains Hesuani. The thyroid gland is particularly sensitive to the effects of radiation, making it a good subject for study in space, but Hesuani says it is vital to study different kinds of tissue. “For example, for female cosmonauts, it’s crucial to look at the functioning of ovaries: that is one of the first organs to be damaged by radiation. So we really hope that our experiments will be continued,” he said, explaining that the first experiment will take place over three days. The analysis of what is printed in space will take a couple of months, he added. The more immediate aim of the experiment is to confirm that formative manufacturing works in space, and to solve some of the technical questions scientists have, said Hesuani. The experiment in space is just one part of a larger experiment that will also make it possible to compare constructs made using different methods of formative technologies, of which there are three, explains Hesuani. Formative technology uses magnetic fields, which enable the constructs to “levitate,” he said. To make the cells and cell tissue respond to the magnetic field, they are grown in nutrient solution that has had metallic nanoparticles added to it. In its lab on Earth, 3D Bioprinting Solutions uses high concentrations of the metallic solution with small magnets that are not especially powerful. But the metallic nanoparticles are toxic to the cells, meaning that only small constructs can be made using this method. The second approach is to reduce the concentration of the metallic solution, but use much larger magnets. The company is due to carry out this kind of experiment this summer with its partners in the Netherlands, using Bitter electromagnets, which create very strong magnetic fields, said Hesuani. The third approach is to use not such powerful magnets and a high concentration of superparamagnetic particles, but to perform the experiment in microgravity, which is what the company plans to do on the Russian sector of the ISS. Usef Hesuani, cofounder of the innovative biomedical company. Photo: 3D Bioprinting Solutions. The 3D bioprinter being sent into space bears no resemblance to the Fabion, 3D Printing Solutions’ model for use on Earth and the first 3D bioprinter created in Russia. The space model is an entirely new kind of printer, and has been christened the OrganAut after the company held a competition to name the automated organ-maker, receiving more than 1,000 suggestions, said Hesuani. For starters, there isn’t a single button or switch on the machine, meaning there is little to do for the cosmonauts themselves in terms of the actual printing process. The bulk of the work is focused on how the biomaterials are prepared for printing, and how they are then preserved after printing, he said. “The hardest thing about the experiment was working out how to get it to the ISS and bring the materials back to Earth,” he said, noting that everything has to be extremely secure and durable, since the experiment involves biological materials. "For female cosmonauts, it’s crucial to look at the functioning of ovaries: that is one of the first organs to be damaged by radiation." Following the initial three-day experiment, the OrganAut will remain on board the ISS as part of the apparatus available in the Russian sector. Any lab in the world will be able to carry out experiments using it, either by using 3D Printing Solutions as an operator, or by working directly with Roscosmos, said Hesuani. One of the aims of the conference is to present to other space scientists and biologists what the company is doing, and what opportunities are appearing on the Russian sector of the ISS, with a view to cooperation, he added. 3D Bioprinting Solutions is not the only company preparing to send a bioprinter to the ISS by the end of the year: the U.S. has announced similar plans for its own sector, Hesuani told the InSpace Forum held in Moscow earlier this month. Researchers at the University of Colorado’s BioServe Space Technologies Center, which is affiliated with NASA, have for several years been investigating the use of 3D printing in space to develop cancer cell structures that more closely resemble those in the human body, with the aim of getting more understanding of how such cells develop. But Hesuani does not see the planned Russian and U.S. printers as rivals. “We really respect what our colleagues from other countries are doing,” he told Sk.ru. “On the one hand, we all have the same task: to solve the problem of regenerative medicine, the lack of donor organs. On the other, we are working to speed up the production of medical treatment: that’s what real people, real patients need. So it’s important that we achieve some result, either together with our colleagues, or separately. And it’s really good that we are carrying out experiments at around the right time: it will spur both us and them on, and we welcome it,” he said. One key difference between the projects is that the U.S. printer will use additive technology, rather than formative technology like 3D Bioprinting Solutions, said Hesuani. The conference “Biofabrication in space: New opportunities for conducting biological experiments” will take place on Wednesday, April 11 at the Hypercube inside the Skolkovo innovation centre from 9 a.m. to 5 p.m.